Our popular Movesense Meetup concept will grow for early November. In addition to the community meetup on Wednesday Nov 7, we will have a separate Movesense Developer Day on Tuesday Nov 6. The Developer Day gives any software developer in the network an opportunity to take their project to a new level by working a day together with Movesense software experts from Suunto. We are aligning the Meetup with Smash, a leading sports tech event for startups in the Nordics, that goes to its 3rd edition on Nov 8. Movesense is one of the Smash partners and we’ll have a dedicated Movesense area at the event where we’ll invite 2-3 companies to showcase their sports & health related Movesense projects with us. Movesense Meetup and Developer Day will take place at Suunto office in Vantaa, Finland. Smash is happening close to Helsinki downtown in the event center Korjaamo. This is a combo that is worth a visit even from further away! is open for all companies and developers who are working on Movesense based projects or interested in learning more about Movesense. Smash participants outside the current Movesense community are also warmly welcome to join. The event is free of charge but a registration is needed. 50 participants will fit in. Movesense Meetup is your opportunity to network with other Movesense community members, find business partners and share experiences with other companies, and to give your input to the future of Movesense. Movesense experts from Suunto will be available for questions during the whole event. 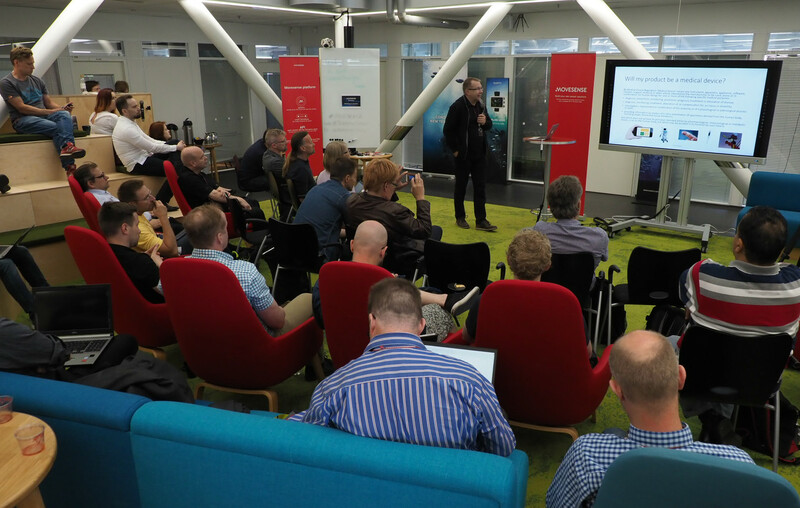 The program includes an overview of the Movesense platform and roadmap, case examples of on-going Movesense projects, and workshops with Suunto experts related to Movesense development and marketing. The event will be highly useful for both developers and business representatives working on Movesense projects. If you have an interesting project that you would like to present to the audience, please get in touch by email or indicate your interest via the sign-up form (registration closed). 1. Getting started: a workshop that will help a new developer to kick-start a Movesense software project. We will go through the essential tips and tricks and give an overview of how to get the best out of the Movesense platform. 2. Movesense Advanced: detailed technical questions and support for ongoing Movesense projects, tools for movement analysis, and other topics to be tailored based on participant needs. This track may split into sub-topics depending on your requests. Developer Day is free of charge but registration is required. We are preparing to work with max 20 participants. You can also include Smash to your agenda and see the latest development in the Nordic sports tech scene or even present your own Movesense based product at the event. We will offer a place at our booth and event passes to 2-3 companies who want to showcase their projects at Smash. For all other meetup participants, there is a discount code for Smash passes: the code SmashPartner20 will give you 20% off from the regular conference pass. 9:00 Developer sessions with Movesense experts. Session themes to be defined based on participant needs. 11:00 Movesense case presentations by network members, topics to be confirmed. All day: Smash. Program to be confirmed.